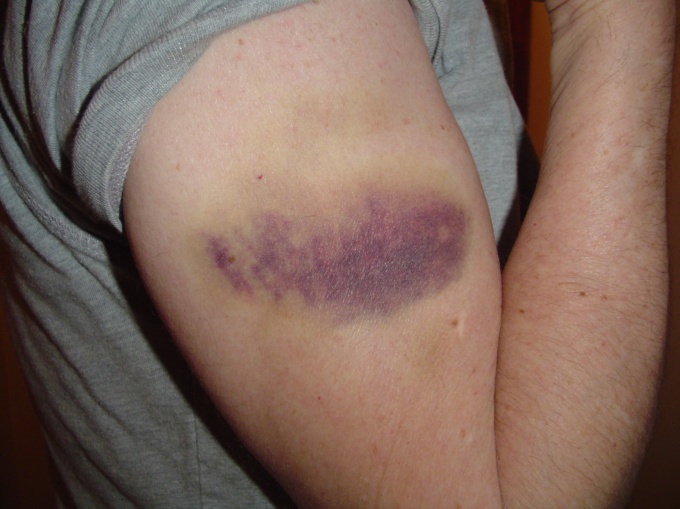 A bruise (hematoma) is a not-very-nice phenomenon. And, of course, the first human reaction is to take after an injury emergency measures: apply cold, grind, etc. But if time is lost, and the bruise came out, then in front of him (and you, of course) – quite long blooming with all the colors of the rainbow. Hospital with the diagnosis "Bruise" is not given, therefore it is necessary in the shortest possible time to get rid of it on their own. Fortunately, there are several effective and quick ways. Buy at the pharmacy concoctions (sometimes spelled "badyaga") and use it according to the instructions in the leaflet. Traditionally, this preparation from the freshwater sponge diluted with sunflower oil (preferably unrefined), stir, applied as a cream directly to the bruise and hold for a while. Sunflower oil can replace any vegetable oil or alcohol, or simply water. If the bruise is on the site where it is possible to apply the dressing to do this (thus achieving a more intimate contact of the drug with a hematoma). On the face use a fresh-water sponge should be very careful that she did not get on mucous membranes of eyes or mouth. Sebagaimana is the name of this procedure of getting rid of bruises, she took first place in the rapid removal of bruises. Make a warm compress. Dampen the cloth with warm water and apply to the bruise. On cooling the wipes soak it in warm water and again apply to the bruise. Heat markedly activates blood circulation, and hematoma will resolve quickly. Water can be replaced warm tea compress this not only resolves the bruise, but also has a slight analgesic property. With the aim of warming up is also used capsicum plaster, however, if the bruise is around the eye area, it is not recommended. Purchase at the pharmacy, special drugs, with absorbing effect. This is a variety of creams, ointments, gels. Such as Caffeine, Bruise OFF, Arnica, first aid bruises, Lioton, Heparin ointment, etc. are also creams, which are composed of Rutin (vitamin P), the chestnut extract, the saliva of leeches (hirudin). Apply hematoma iodine mesh. Parisvisite her when she becomes barely visible. Apply to the bruise a cabbage leaf, calendula flowers (marigold), plantain leaf or burdock, if the bruise you received during garden work in the country. Suitable also blossoms, and mullein leaves mother and stepmother. Well before using leaves and flowers gently muddle to bring out the juice. Excellent results will give raw potatoes. RUB the potato on the grate and apply the pulp to the bruise. If there is no float, you can cut the potato slices and one by one, after 2-3 minutes, apply to the affected area. If bruises appear, not only from severe injury, but from the barely perceptible to the touch (when you wonder "where did this come from? Oh, and here, too! "), it is a signal that you need to take vitamin C. It helps to strengthen the walls of blood vessels, which, apparently, you have a very thin.